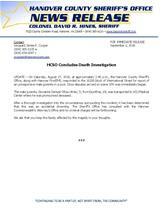 UPDATE – On Saturday, August 27, 2016, at approximately 2:46 p.m., the Hanover County Sheriff’s Office, along with Hanover Fire/EMS, responded to the 16200 block of International Street for report of an unresponsive male juvenile in a pool. Once deputies arrived on scene CPR was immediately began. The male juvenile, Giovanne Samuel Ofosu-Antwi, 5, from Dumfries, VA, was transported to VCU Medical Center where he was pronounced deceased. After a thorough investigation into the circumstances surrounding this incident, it has been determined that this was an accidental drowning. The Sheriff’s Office has consulted with the Hanover Commonwealth’s Attorney’s Office and no criminal charges will be forthcoming. We ask that you keep the family affected by this tragedy in your thoughts.